I’ve been neglecting my blog this week. It’s not that I don’t think “I need to write about this!” every time I eat a delicious morsel or spy some interesting food item – mostly, it’s that I hesitate to post without a picture, and after a day at work, the lighting in my house can most pleasantly be described as “romantic”. So I’m going to tell you about the pot of risotto I made tonight, but you’ll just have to imagine how beautiful it looks. 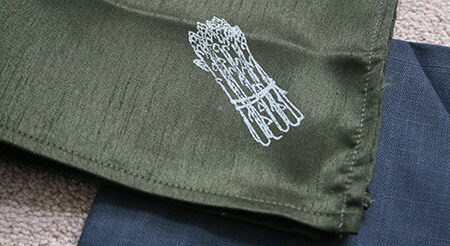 No food photo, but check out this asparagus napkin I silkscreened at AS220’s print shop yesterday! Sometimes I gravitate towards recipes with multiple diced vegetables – I read them slowly, thinking of how therapeutic all that chopping will be (I suspect that visions of the beach do this for most people, but I’ll take what I can get). Last night I was reading Ruth Reichl’s Garlic and Sapphires, and when I got to the Risotto Primavera recipe, I knew it was the perfect fate for my Monday night and the extra bunch of farmers’ market asparagus I’d been saving. While it doesn’t take that long to prepare, it’s the perfect evening “cooking retreat” – an excuse to turn off the phone, the TV and the computer, and immerse yourself in the acts of chopping vegetables and stirring risotto. I didn’t realize how much I relied on the internet for cooking ideas and recipes. Of course, my collection of cookbooks is vast and I love to consult them, even as bedtime reading. But often, especially when I’m stuck with ingredients that need to be used up, I head for the world wide web. Usually, I find several recipes and mix techniques and ingredients based on what I have at hand. In the process of moving, I lost my internet connection for a couple of weeks. On top of that, my laptop is still in the shop, so going online isn’t very convenient. In these tough times (maybe I’m being a bit dramatic) I’ve called upon an old friend – The Joy of Cooking. The Joy of Cooking has always been my go-to cookbook. I would take it with me to the proverbial deserted island: if nothing else, its directions for prepping raccoons and possums might come in handy. In more mundane situations, the recipes are relatively simple and often are accompanied by tidbits of wit and wisdom. Last week, unable to access my favorite bookmarked pizza recipe, I used its recipe for pizza dough on page 610 and it was perfect. This week, I baked cinnamon buns based on their recipe for Cinnamon Snails (p. 614), leaving in the cardamom because it’s one of my favorite flavors. The recipe for Chicken Marengo seemed like the perfect way to use some of the chicken leg quarters in the freezer, especially after I was seduced by the description of how Napoleon had it prepared after his battles. To soak up its delicious wine and brandy-flavored broth, I whipped up a batch of Cheese Muffins (p. 631) in minutes and simply baked them in the oven with the chicken. The Joy of Cooking was first published by Irma Rombauer as a way to support her family after her husband’s suicide during the depression. At the time, many families were struggling with very little, and the recipes and techniques in the book were both practical and economical. I recommend the 1975 version (or earlier), which can often be found at used book stores. The 1997 version lacks many of the classic recipes. The latest 75th anniversary edition returns to the book’s original spirit, but I still prefer the older copies.